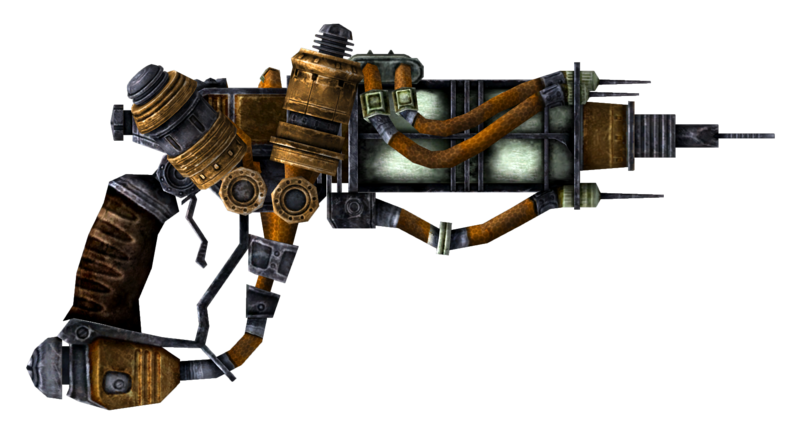 Plasma casters are high-tech weapons which find numerous applications in military and industrial fields. They fire superheated bolts of plasma powered by either microfusion cells, heavy energy cells or plasma cartridges. The bolt forms in a special chamber, which is then sent down a superconducting barrel, propelled by, and in some models stabilized by electromagnetic claws upon exiting it. Time to reload: 1 turn. Cost of Ammo: 2 per shot. Cost to repair: 120 Caps. 0-15: The weapon jams until the next turn. 46-75: The attack scratches your objective. Doing 12 Hit Points. 76-90: The attack hits your objective. Doing 30 Hit Points. 91-99: Critical attack. Doing 65 Hit Points. 100: Extremely critical attack. Killing automatically. Unless the enemy wields Power-Armor.